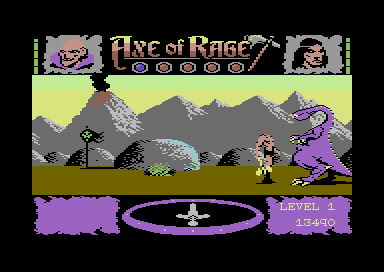 Known in Europe as Barbarian 2, Axe of Rage was released in North America by Epyx in 1988. 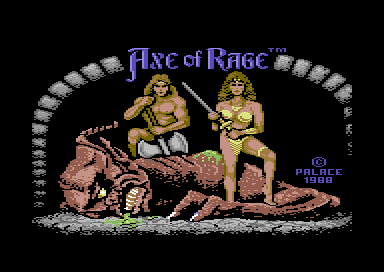 Barbarian 2 (Palace Software) was banned in Boots in the UK for featuring a pin-up model on the cover. The name and cover change on the North American licence, probably an attempt by Palace and Epyx to avoid such controversy. Although the game still managed to be banned by a wholesaler in Canada, because, I dunno, the guy's face on the cover was too ugly or something. While Barbarian 2 cracks are two-a-penny on CSDB, Hokuto Force have managed a smart release here, by properly PAL fixing this version which was itself a rather lazy NTSC port of the European original. Developers tried to expand on the successful 1v1 beat-em-up formula of the original, by placing your character in a maze of screens and randomly placing two objects inside which you must collect before entering the exit to the next level. 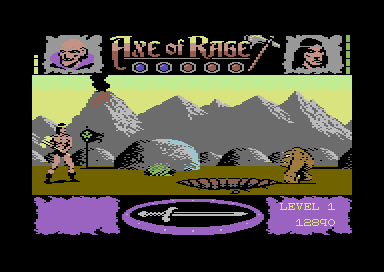 You can play as male or female barbarian, and there are many varied enemies on each level although all of them can attack faster than you, so combat can become very tiresome quickly. Pits, traps, lava and rocks hinder your progress and giant purple dinosaurs try to bite your head off. The animation of the main character is also pretty well implemented. However, combat is a tiresome exercise in precise timing as your attacks take that little bit longer to strike than your enemies. The way you traverse the screens in the maze is also quite confusing, as you sometimes appear on the wrong side of the screen than you would expect. If the game's frustration level is getting the better of you fear not. Hokuto Force's excellent trainer selection is included to help ease the (excruciating) pain. Choose from the following; Save high scores (no trainers), unlimited lives, unlimited energy, one touch kills (the game is much better with this on! ), start with all items, ignore lava, slimes, and/or holes. Level 4 can also be switched with the Barbarian 2 original version, enemies can't damage, and add enemy skip and level skip buttons. There's also an added loading screen, fixes to the poor disk loading mechanics of the original, and the excellent Hokuto Force documentation reader with silky smooth pixel scrolling and a nice new intro. Don't lose your head!